GRP end of platform gated access steps provides railway personnel with safe and secure access to non-ramped platform ends or any raised operating facility. Complete with all safety guardrails these units provide a long lasting and maintenance free solution. All gated steps are bespoke made to specifications as requested by the client. 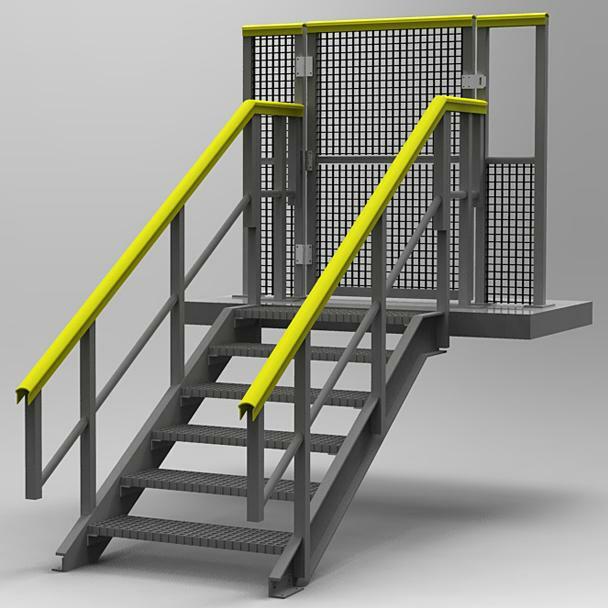 Safe and secure access for railway staff to non-ramped platform ends or any raised the operating facility may be achieved using end of platform gated access steps made from composite materials. 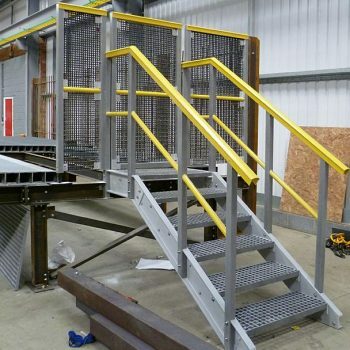 A full design, drawing and engineering verification service is available for these products, with prefabricated units being delivered to site for rapid installation. Complete with all safety guardrails these units provide a long lasting and maintenance free solution. All tread surfaces are finished with a highly durable, Anti-slip coating for all weather conditions. Gates are lockable for added security.